The most popular way to explore Halong Bay is through a cruise on a ‘junk boat’ which is actually a liveaboard cruise ship. Most junk boats have around 15-20 cabins so the groups are more intimate than what you normally expect from a cruise ship. 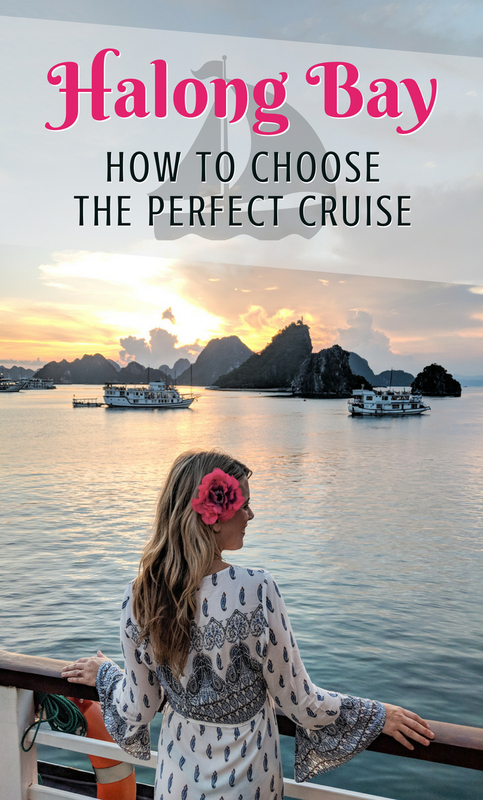 Read on to learn all about when to go, what to pack, and how to choose the right boat in Halong Bay! Halong Bay is located about 100 miles east of Hanoi. Transportation to and from the bay is often included in your cruise ship package and they will pick you up from your hotel at around 8:00 in the morning. The standard included transportation package is on a large but comfortable and air conditioned bus, or you can pay extra for a private car. There is a brand new higway that has cut the travel time from Hanoi to Halong Bay down to about 2.5 hours. However, it is a toll road and some cut-rate cruise operators will choose to take the old road rather than pay the $15 toll. This adds almost 2 hours to the time you’ll be sitting in a bus or car so make sure you confirm with your travel agent or cruise operator that you will be taking the new highway. 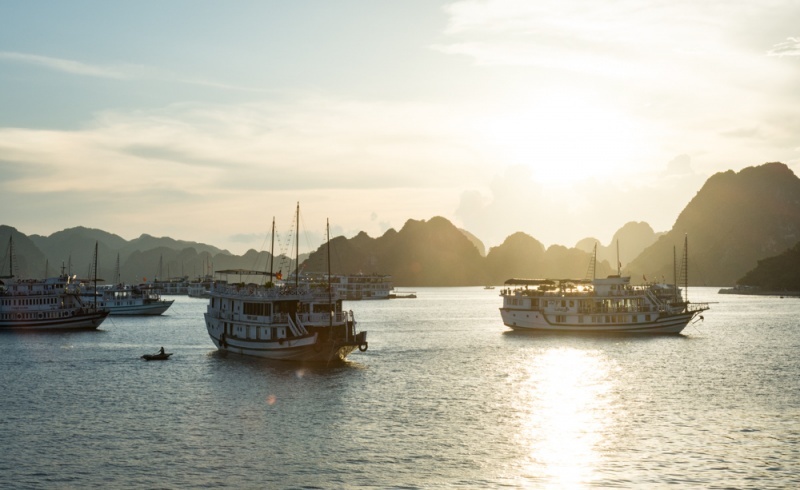 It’s also possible to travel directly between Halong Bay and Ninh Bình which will save you some time if you’re planning on visiting both and don’t want to return to Hanoi in between. Note: If you book your cruise through Booking.com rather than through a local travel agent make sure you read the fine print. You may need to pay an additional $25-40 USD per person for a roundtrip transfer to/from Hanoi. Update January 2019: On December 30, 2018 Vietnam opened a brand new international airport on Van Don Island, just 50km away from Halong Bay (~1 hour by car). So if you’re planning on visiting Halong Bay at the begining or end of your trip to Vietnam you should consider flying in or out of Van Dong International Airport to save yourself some travel time. Junk boats operate year-round so you can visit Halong Bay at any time, as long as you don’t mind a little rain. The best time to visit is from October until March when temperatures are pleasant and rainfall is light, if at all. Of course you’ll also have to contend with more crowds during that time and should plan on booking your tour in advance. April to September is hot and humid and experiences the highest rainfall of the year with August being the wettest month. Most Halong Bay cruise itineraries will pick you up in Hanoi at around 8:00am and get you to the boat around 12:00pm. You’ll have lunch on the boat, a few afternoon activities, dinner, and you’ll depart the boat the next day around midday if you choose the 2-day/1-night option which is the most popular. We opted for the 3-day/2-night option which felt more relaxing as we had an extra night on-board and didn’t feel so rushed to unpack and then repack our luggage. We also found that the day 2 activities were far less crowded so we were able to enjoy them more. 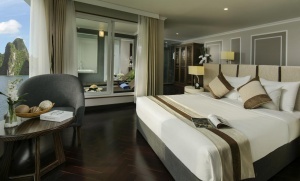 There is also a 2-night option where you’ll spend the second evening at a hotel on Cat Ba Island. Many tourists opt to book their ‘junk boat’ cruise through the many tourist agencies around Hanoi. There are literally dozens of boat options so the tourist agencies will generally only show you their top one or two in order to keep you from getting overwhelmed (or so they say). Local travel agents like Halong Bay Tours can sometimes get you better prices than what you can find online, but before entering a travel agency do some research on Booking.com and TripAdvisor to find the top rated cruise boats and then compare rates offered by travel agents against rates offered online. 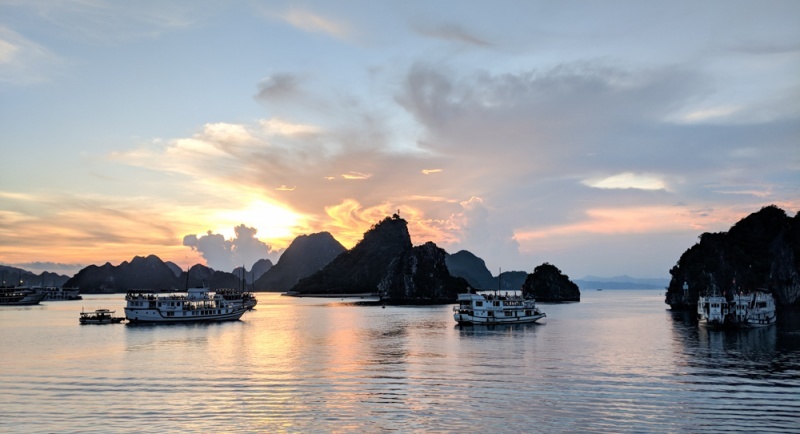 Local tour companies are also happy to arrange tours that include both a day in Ninh Bình and an overnight cruise in Halong Bay which can be a good option to consider if you’re short on time in Northern Vietnam. If you’re already in Hanoi you should also consider asking at the reception desk of your hotel as almost all Hanoi hotels offer similar services to travel agencies. How many cabins are on the ship? 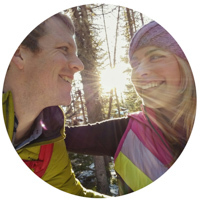 What do the reviews say on Booking.com or Tripadvisor? You can save a bit of money by choosing a lower-end cruise line or by forgoing a private balcony off your room. 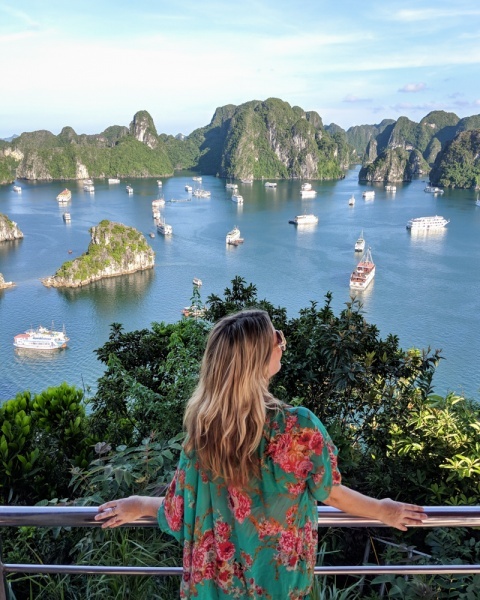 And most of the ships do offer a similar schedule of activities so no matter what boat you pick, you’ll get to see the highlights of Halong Bay. But if you want to really enjoy your time on board, opt to pay a bit more for a private balcony. Peony Cruises only recently began sailing in October 2018, so their boats are brand new and state-of-the-art. 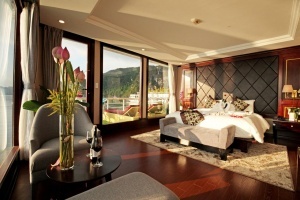 They’ve incorporated both luxury and style into their immaculate, spacious staterooms. And to top it off, their boats operate in a different area of the bay than most of the other cruises so you’ll have a more unique itinerary with fewer crowds! Sailing with Peony Cruises is a truly amazing experience! 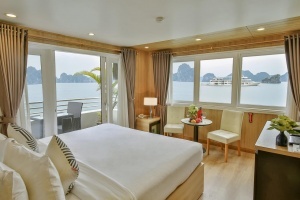 Athena Elegance Cruise is a new addition to the Halong Bay cruise ships so you’ll appreciate that the furniture and appliances are free from the wear and tear of other boats. With 3 decks, 21 spacious and luxurious cabins, a rooftop sundeck, coffee lounge, bar, and sauna, you won’t even want to get off of this gorgeous ship to explore the bay! Era Cruises is the ultimate in world-class service and style! You’ll forget that you’re even on a boat (aside from the amazing bay views from your private soaking tub). Rooms are huge and elegantly decorated, there is an onboard fitness center and spa, the food is delectable, and you’ll be treated like royalty by the amazing staff. La Pinta Cruise has a mission of “safety – elegance – sophistication”, and those words really sum up what to expect from your onboard experience. 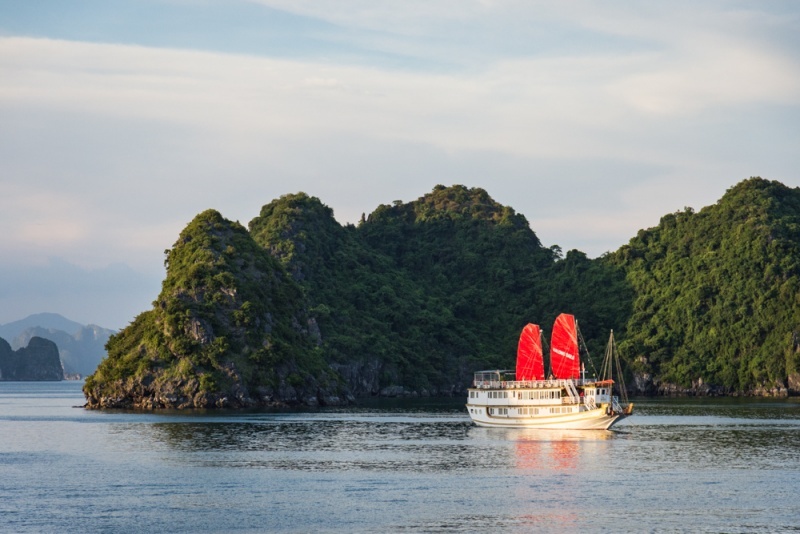 They offer 16 spacious cabins but the real advantage of La Pinta is that they take a different tour route which will allow you to avoid a lot of the crowds and have a more relaxing Halong Bay experience. You’ll need your passport to travel to Halong Bay and your tour guide will ask for it during your bus ride to the area. Be sure you have it in your handbag for easy access rather than stored in your luggage under the bus. The bus ride to Halong Bay takes around 2.5 hours and most make one stop at a massive souvenir store. They’ll drop you off on one end and pick you up on the other 30 minutes later. The souvenir store has clean western-style toilets and sells everything from giant Buddha statues to traditional clothing to gold jewelry and everything in between. Everything here is outrageously expensive, especially the snacks. If you think you might get hungry or thirsty during the bus ride, best to pack your snacks rather than wait to buy them here. Some of the higher end boats may provide drinking water while on board but for many it is an extra charge. You’ll likely get a bottle on the bus and two in your cabin, but you’ll then have to pay for the rest while on board. You’ll want to pack a swimsuit both for swimming at Ti Top Island and for kayaking around the bay. Don’t worry about bringing a beach towel. Your cruise ship will provide you one as you are getting off the boat. There are a few reasons that tennis shoes would come in handy during your trip to Halong Bay. You’ll climb a lot of stairs during your visit to Surprise Cave and Ti Top Island (if you choose to visit the lookout) so you’ll find that you are more comfortable in tennis shoes rather than flip flops. The caves can also be quite slippery after a heavy rainfall so you’ll appreciate having shoes with some traction. These hiking shoes by Merrell are lightweight, super durable, and have a breathable mesh lining to keep your feet cool. You’ll love lounging on the rooftop deck of the cruise ship, soaking in the views of the limestone pillars surrounding you. Some boats have a lot of shady areas while others are full sun. You’ll also probably spend some time kayaking in the hot midday sun. Be sure you have the proper protection for your skin and hair so you don’t get scorched. You may also want to pack a foldable sun hat for extra protection for your face. 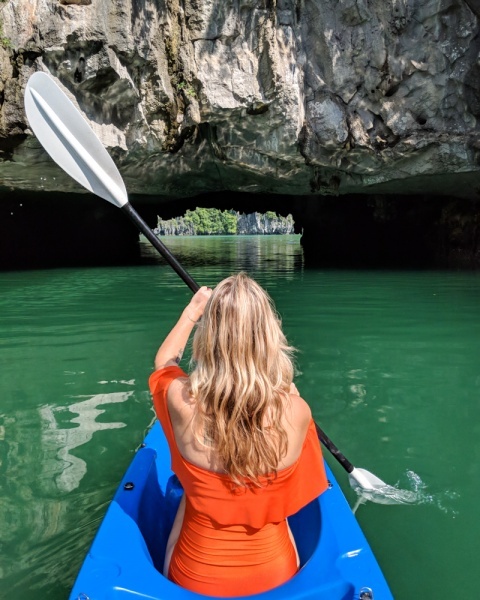 If you want to snap a few photos while kayaking around Halong Bay, you’ll want to invest in either a waterproof cellphone case or a waterproof camera. This universal waterproof case is inexpensive and super easy to use if you think your phone is in danger of getting splashed. Every Halong Bay cruise ship includes meals during your stay, but not all include alcohol and other beverages. And while the drinks will certainly cost you more than what you’d expect in Vietnam, they generally aren’t outrageous. Expect to pay about $1 USD for water and soda, $3 USD for juice, $2.50 for beer, and $6 for wine on a moderately priced boat. The fancier the boat, the higher the drink prices of course. While you may be tempted to bring your own alcohol on board, be aware that most of the boats charge a ‘corkage fee’ for any beverages that you don’t buy on the ship. 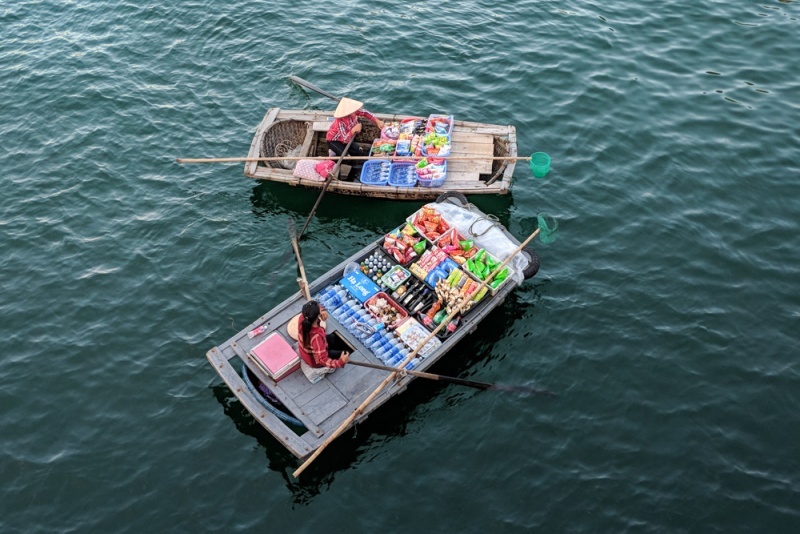 This includes any drinks from the enterprising local ladies on tiny row boats cruising around the bay trying to sell various sundries to cruise boat passengers. Expect to pay an additional ‘corkage fee’ of $20 USD on wine and $1 USD on any beer or soda that you bring with you. At the end of the day, you’ll end up paying the same as if you just buy your drinks from the cruise ship bar. Note: The ‘corkage fee’ doesn’t apply to water, snacks, and souvenirs so if you want to support the locals you can always buy a couple bottles of water or some trinkets. 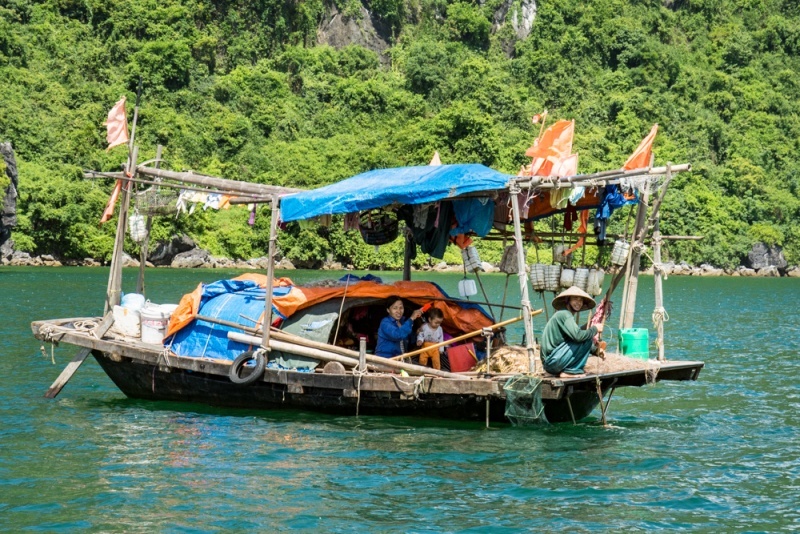 Listed below are a few of the most popular activities that are generally included in junk boat tours around Halong Bay. Surprise Cave and Ti Top Island are the two most popular activities and will probably be a part of your visit regardless of how long you stay. Most cruise ships offer an early morning relaxing tai chi lesson on the rooftop deck. 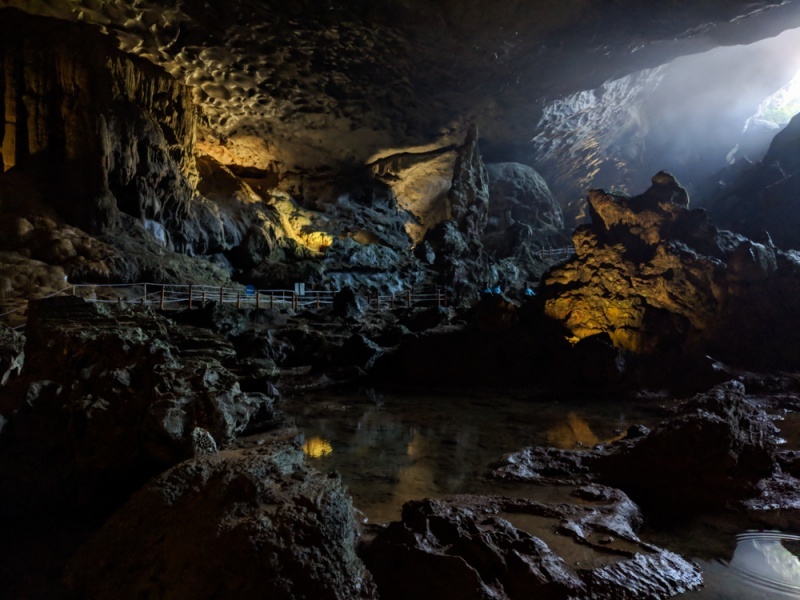 Sung Sot Cave – also known as “Surprise Cave” – is one of the most popular destinations in Halong Bay, and for good reason. You’ll start by climbing a long set of stairs where you can stop along the way for fantastic views of the bay below. And once inside the cave you can follow the path that winds around the interesting stalactites and stalagmites. It’s a massive cave that is well-lit and easy to navigate with or without a guide. Keep in mind that Surprise Cave gets very crowded and would be difficult to access if you have any issues with mobility. Ti Top Island is another major stop along the Halong Bay tour route. You’ll have time to lounge on the beach, swim in the sea, or climb to the lookout high above for the most incredible 360° views of the bay. The stairs to the top are very steep and no doubt you’ll be sweaty and out of breath by the time you reach the top. This is another crowded spot in the bay. There is a changing area to change into your swimsuit but the toilets are squatty potties so you may want to plan ahead. A “cooking class” may be offered on your last day on the ship. Ours was a brief lesson in rolling rice paper spring rolls. Me Cung Cave has a few different chambers to explore. You’ll get to see the beautiful Maze Lake from an opening in the cave wall and you’ll get to experience the interesting acoustics as you get deeper inside. You’ll need to either crab walk or crawl through two very small cave openings so if you have trouble with your back or knees this may be challenging. And this cave gets quite slippery after a heavy rain. This was our favorite activity of our Halong Bay tour experience. You’ll kayak through a cave and into a large lake that is surrounded by massive walls and lush vegetation on all sides. If you’re lucky you may even spot a monkey along the banks of the lake. 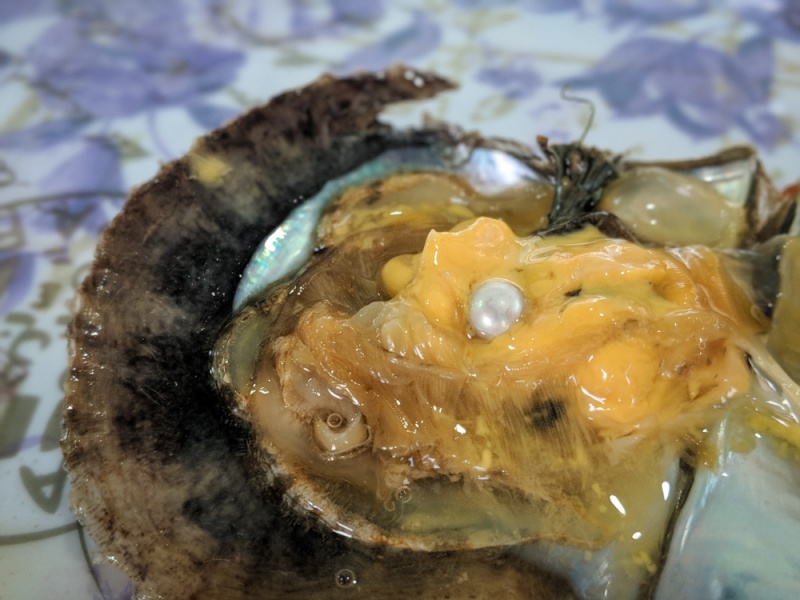 This is a brief trip to a pearl farm where millions of oysters are being manipulated to create unnatural pearls and thousands of oyster shells are being cleaned every month. The tour ends in the incredibly overpriced gift shop. Head straight to Cat Ba Island, stay in a hotel there, and arrange more personalized boat trips of the bay. 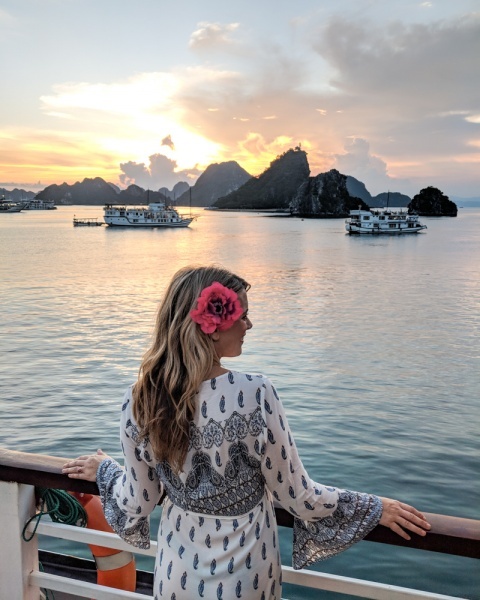 Pass on Halong Bay and instead choose to explore the less-crowded but also incredibly beautiful Bai Tu Long Bay or Lan Ha Bay. Choose a cruise company that offers an alternative route of Ha Long Bay such as La Pinta Cruise.